Oxfam believes that Economic Social and Cultural rights are an essential element of a rights-based approach to development, which is our fundamental vision, and of anti-poverty work. Our experience working across the UK with poor and marginalised groups and communities is that people experiencing poverty frequently lack access to a range of economic and social as well as civil and political rights. 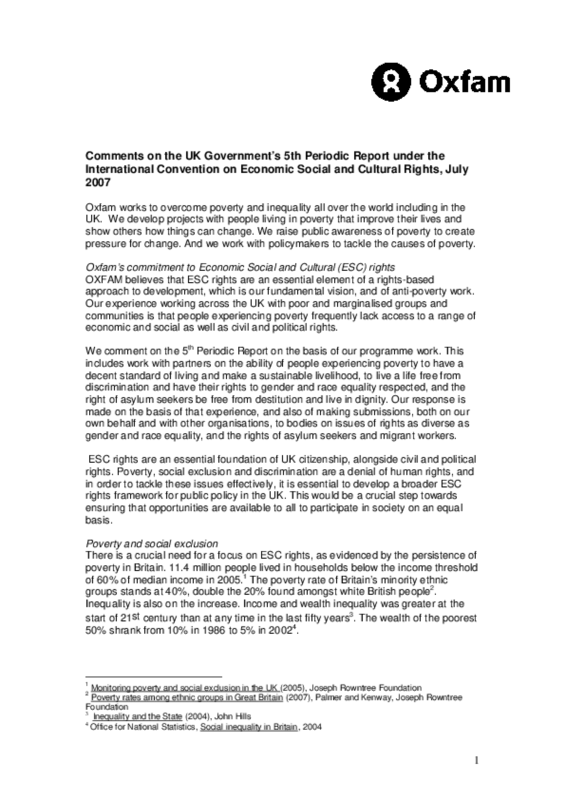 We comment on the 5th Periodic Report on the basis of our programme work. This includes work with partners on the ability of people experiencing poverty to have a decent standard of living and make a sustainable livelihood, to live a life free from discrimination and have their rights to gender and race equality respected, and the right of asylum seekers be free from destitution and live in dignity. Our response is made on the basis of that experience, and also of making submissions, both on our own behalf and with other organisations, to bodies on issues of rights as diverse as gender and race equality, and the rights of asylum seekers and migrant workers.